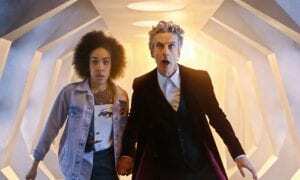 Doctor Who Review: "The Woman Who Lived"
We last left Ashildr recovering from death, presumably immortal but who really knows when the Doctor is involved. This week’s episode takes place almost a thousand years later, dropping the audience square in the middle of a robbery that the Doctor stumbles into as he’s tracking down technology that doesn’t belong in 1651. After the Doctor foils The Knightmare’s robbery and lets the advanced technology get away, The Knightmare reveals herself to be none other than Ashildr, though she now goes by “Me”. It is evident right away that after years living among mortals, Me has become emotionally hardened and very jaded to the human race. Robbing for fun, killing because she can, and otherwise honing skills to be superior in every way, Me seemingly has little regard for the people around her. She has an enormous library of personal journals documenting her multiple lifetimes of memories that recount far too many tales of pain and suffering, the worst ones actually torn out of the books. The painful loss of her children remained in the journals only to remind her to not to have them again. Me’s story is all-too-familiar, while she still has her entire race and planet immediately accessible, she has lost all that she loved, from her family to her hometown to her own beloved children. We’ve watched the Doctor lose his entire planet, family and children included, only to gain it all back except that it is lost in somewhere in time and space, not to mention the numerous companions we’ve personally watched come and go. It was all very emotional. For the Twelfth Doctor to start off his tenure very much the same mindset as Lady Me is in this episode to now find himself in the position of defending humankind against all of that mis-directed anger and bitterness is powerful and resonates throughout their interactions. The character depth and subtle shifting in character development has been admirably executed by Capaldi and his writers. Me was thankfully far more complex than Ashildr, being both apathetic and desperate, blaming the Doctor for all her problems but not willing to make an enemy out of him, and always wishing he would save her from this hell she found herself in. The emotional range was significant and though it mostly sided on the horrible rather than the wonderful, Maisie Williams delivered a phenomenal performance throughout. The foreshadowing of Clara’s exit might as well have been spray painted on the TARDIS. As Twelve is confronted with a lot of hard truths about immortality and loss, Clara is noticeably absent from the entire episode only to show up at the very end and give Twelve a hug. The hug itself isn’t suspect, Clara’s always been a hugger, it’s more that Twelve lets her do it. He also has that wistful look on his face during the hug, as if he knows she’s about to become one of those “puffs of smoke” Me was referring to. Let’s not forget Ashildr’s creepy and foreboding photo-bombing of Clara and her student. While I wouldn’t call their relationship “friendship,” Me offered her immortal ability almost as an alliance, that while the Doctor saved the world at large from dangers of the universe Me would take care of the companions he had to leave behind. Initially it sounded quaint and almost comforting but her appearance in the picture definitely turned that pleasant thought into a far less settling impression of some sort of angel of death. Very creepy. Now that the Doctor has figured out his identity crisis and his purpose in this life, it seems that the new running theme is going to be the waves and tidal waves created by his meddling in time. While his intention is to do good or at least do as much good as possible in any given situation, we are slowly (and sometimes not-so-slowly) coming to understand that doing good at one moment in time may not end up being so great later on. Actions still have consequences, whether intended or not. Will this tie into the Impossible Girl’s role in the Doctor’s life as a whole? Who knows. 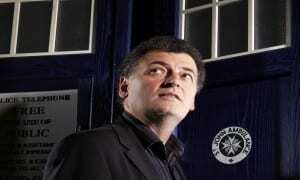 Maybe it will just be the nagging question that follows Twelve everywhere he goes. 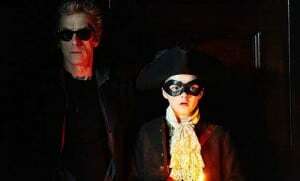 The Doctor will be missing his sonic technology now that the sunglasses have been destroyed. Perhaps it is time Twelve gets his own version of the iconic sonic screwdriver, and how fitting it would be to get a new sonic screwdriver and a new companion so Twelve can rid himself of most of the previous Doctor’s hand-me-downs. Or maybe that’s a terrible thing, I’m not sure. Only time will tell! What did you think about Maisie Williams’ performance in this week’s episode versus last week? Are you looking forward to the return of Osgood as much as I am? Hit us up in the comments below or on Google+, Facebook, or Twitter!